43 Palestinian civilians, including 17 children, were wounded in the West Bank and Gaza Strip. 26 of them were hit with live bullets, 11 were hit with rubber bullets, and 6 were hit with tear gas canisters and shrapnel. Israeli forces conducted 82 incursions into Palestinian communities in the West Bank and a limited one into the southern Gaza Strip. 78 civilians, including 14 children and 2 women, were arrested. 30 of them, including 9 children, were arrested in Jerusalem. 9 shooting incidents targeting the Palestinian fishing boats off the Gaza Strip Shore, but no casualties were reported. A tent, cave, 2 sheds used for sheltering sheep in Qana Valley area, northwest of Deiristiya village. A house was demolished in Beit Kahel village, and a warehouse built of tin plates was dismantled and confiscated in Beit Ummar in Hebron. Settlers continued their attacks against Palestinian civilians’ property in the villages near settlements. 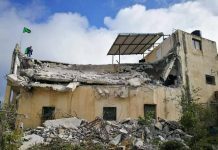 Two commercial barracks were demolished in al-‘Issawiyah village, northeast of occupied Jerusalem. Settlers severely wounded a Palestinian civilian and attacked 5 cars. 5 Palestinian civilians, including a child, were arrested at the checkpoints in the West Bank. Israeli violations of international law and international humanitarian law in the oPt continued during the reporting period (08 – 14 February 2018). At approximately 01:00, Israeli forces moved into Jenin. They raided and searched several houses and then arrested 5 civilians, including 2 brothers and their uncle, namely Ahmed Mahmoud al-Kastuni (26), from al-Marah neighbourhood, south of the city, Mohammed (20), his brother Mahmoud Nasri al-Sahalabi (24), their uncle Salah Jaber al-Shalabi (30), from Harsh al-Sa’adah, and Suheib Jarir Jarrar (28), from Burqin Valley, west of the city. At approximately 02:00, Israeli forces moved into al-Laban eastern village, south of Nablus. They raided and searched several houses and then arrested Sarhan Ref’at Daraghmeh (26) and Mohammed Harbi Darghmeh (15). At approximately 02:30, Israeli forces moved into Duma village, south of Nablus. They raided and searched several houses and then arrested Abdul Salam Abdullah Dawabsheh (20). At approximately 06:30, Israeli forces moved into Kafer Malek village, northeast of Ramallah. They raided and searched a number of houses and then arrested Yunis Khairi Ba’erat (30). At approximately 07:00, Israeli soldiers stationed at military checkpoint (160), east of the Ibrahimi Mosque in Hebron, randomly fired tear gas canisters at government and UNRWA schools. As a result, several students and teachers suffered tear gas inhalation. They received first aid by the Palestine Red Crescent Society (PRCS). Moreover, schools closed and the school day was cancelled in case of further Israeli attacks. At approximately 07:30, Israeli forces accompanied with several military vehicles moved about 100 meters from “Kissufim” military site, east of al-Qararah village, east of Khan Yunis in the southern Gaza Strip. They levelled the lands in the area amidst sporadic shooting. The Israeli forces then headed to the border fence between the Gaza Strip and Israel. Few hours later, the Israeli forces redeployed along the border fence, east of ‘Abasan al-Kabirah, and no arrests were reported. At approximately 07:40, Israeli forces moved into al-Mazra’ah al-Gharbiyah village, northwest of Ramallah. They raided and searched a house belonging to Ya’qoub Hani Ladadwah (24) and then arrested him. At approximately 17:00, Israeli forces moved into al-‘Arqah village, west of Jenin. They then arrested Mohammed (16) and his brother Diya’a Jamil Yahiya (17) when they were at the outskirts of the village. Note: During the aforementioned day, Israeli forces conducted (7) incursions in the following areas and no arrests were reported: Ramin village, east of Tulkarm, Hablah village, south of Qalqiliyah, Kafel Hares village, north of Salfit, Deir Estia village, west of the city, Eskaka village, east of the city, Halhoul and Traqumiya village in Hebron. 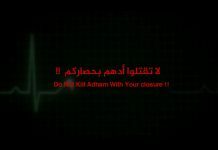 At approximately 07:00, Israeli gunboats stationed off al-Waha shore in the northern Gaza Strip, sporadically opened fire at Palestinian fishing boats sailing within 4 nautical miles and chased them. The shooting recurred at approximately 08:20 on the same day and sporadically continued until approximately 09:15. As a result, the fishermen were forced to flee fearing for their lives, but neither casualties nor material damage was reported. At approximately 10:00, a number of Palestinian farmers, from Madama village, south of Nablus, went to plough their lands in al-Sawawin and al-Rasem areas, south of the village. Israeli forces arrived at the area and gave the farmers 20 minutes to leave t, but the farmers refused so. 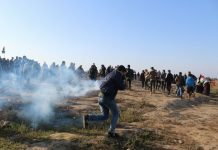 The Israeli forces then fired sound bombs and tear gas canisters to disperse the farmers and then chased them into the village. As a result, a 30-year-old civilian was hit with shrapnel to the chest when he was near a high school. He was then transferred to Rafidiya Hospital in Nablus to receive medical treatment. Doctors there classified his injury as moderate. 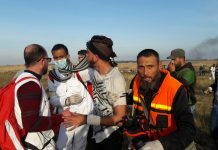 At approximately 12:30, Israeli gunboats stationed off al-Waha Shore in the northern Gaza Strip, opened fire at Palestinian fishing boats sailing within 3 nautical miles and chased them. As a result, the fishermen were forced to flee fearing for their lives, but neither casualties nor material damage was reported. Note: During the aforementioned day, Israeli forces conducted (5) incursions in the following areas and no arrests were reported: Nablus and Kafel Hares village, north of Salfit; Ethna, al-Thaheriyah and al-Koum villages in Hebron. At approximately 02:00, Israeli forces moved into Tayasir village, east of Tubas. They raided and searched a number of houses and then arrested Fayad Eyad al-Deek (37), a Civil Police officer in the Special Units. At approximately 02:50, Israeli gunboats stationed off al-Sudaniyah shore in the northern Gaza Strip, opened fire at Palestinian fishing boats sailing within 5 nautical miles and chased them. As a result, the fishermen were forced to flee fearing for their lives, but neither casualties nor material damage was reported. At approximately 06:30, Israeli gunboats stationed off al-Waha shore in the northern Gaza Strip, heavily opened fire at Palestinian fishing boats sailing within 4 nautical miles and chased them. The shooting recurred at approximately 11:15 on the same day. As a result, the fishermen were forced to flee fearing for their lives, but neither casualties nor material damage was reported. Note: During the aforementioned day, Israeli forces conducted (5) incursions in the following areas and no arrests were reported: Qalqiliyah, Dura, Nuba village, al-Fawar refugee camp, Nemrah area in Hebron. At approximately 00:45, Israeli forces moved into Nablus. They raided and searched a number of houses and then arrested 5 civilians, including a woman, namely Woroud Abdul Hakim Marish (45), aunt of Abdul Karim ‘Aasi, who is accused of killing the Rabbi Itamar Ben-Gal near “Ariel” settlement, north of Salfit, On 05 February 2018; Jihad Mo’een Suleiman Marish (40), both of them were arrested from their house in Kalbuneh building in Rafidiya neighborhood, west of the city; ‘Ali Ragheb Salhab (26), ‘Odai al-‘Aasi (22), both arrested from Mo’tah Street, west of the city; and Mohammed al-‘Aasi (24), who was arrested from Khelat al-‘Amoud, southeast of the city. At approximately 01:00, Israeli forces moved into al-Samou’ village, south of Hebron and stationed in al-Semia area. They raided and searched a house belonging to Abdul Hakim ‘Ali al-Daghamin (42) and then handed him a summons to refer to the Israeli Intelligence Service in “Gush Etzion” settlement complex, south of Bethlehem. Around the same time, Israeli forces moved into Yatta, south of Hebron. They raided and searched 2 houses belonging to Maher Mahmoud Rawashdah (29) and Khalid Jebril Shehadah (34) and then handed them summonses to refer to the Israeli Intelligence Service in “Gush Etzion” settlement complex, south of Bethlehem. At approximately 02:00, Israeli forces moved into Bethlehem and stationed in Hendazah area, east of the city. They raided and searched a house belonging to Hussein ‘Atef ‘Obayat (18) and then arrested him. It should be noted that Hussein is the son of ‘Atef ‘Obayat, was assassinated by the Israeli forces in 2002. At approximately 03:00, Israeli forces moved into Husan village, west of Bethlehem. They raided and searched a house belonging to Jamal Jaber Hamamrah (54), a leader in the Islamic Jihad Movement, and then arrested him. It should be noted that Hamamrah was arrested several times and spend sporadically 14 years in the Israeli prisons during which he went on a hunger strike. Hamamrah is a teacher and one of Palestinian Marj al- Zohour deportees in Southern Lebanon in 1991. Around the same time, Israeli forces moved into al-Thaheriyah village, south of Hebron and stationed in Karm al-Ashqar area. They raided and searched a house belonging to Ayman Khalid al-Battat (39) and handed him a summons to refer to the Israeli Intelligence Service in “Gush Etzion” settlement complex, south of Bethlehem. At approximately 04:40, Israeli forces moved into ‘Anabtah village, east of Tulkarm. They raided and searched Bessan Factory for air conditions. The soldiers confiscated equipment and data servers related to the production process in the factory. However, no further incidents were reported. Aat approximately 06:30, Israeli gunboats stationed off al-Wahah shore, northwest of Beit Lahia in the northern Gaza Strip, opened fire at Palestinian fishing boats sailing within 1 nautical mile. They then surrounded a fishing boat manned by Tariq ‘Abdel Bari Mohammed al-Sultan (22) and ‘Aaed Nizar Mohammed al-Sultan (22), both from al-Salatin neighborhood in Beit Lahia. The fishing boats were about 1200 meters off the northern Gaza Strip shore. The Israeli soldiers ordered them to take off their clothes, jump into the water and swim towards the gunboat. They were taken to Ashdod Seaport and interrogated to be released at approximately 20:00 on the same day through Beit Hanoun “Erez” crossing. It turns out that both fishermen were hit with rubber bullets by the Israeli naval soldiers as Tariq al-Sultan was hit with 2 bullets to both legs while ‘Aaed was hit with 4 rubber bullets to both legs and abdomen. At approximately 10:25, Israeli forces moved into Hares village, northwest of Salfit. They patrolled the streets and deployed the area. The soldiers then detained 4 civilians namely Husam Saleem ‘Ali Sultan, Habib Hasan Yusuf Sultan, Ahmed Joudah Mohammed Dawoud, and Nayef Basel Yusuf Souf. The Israeli forces released them later after they questioned them on the spot. At approximately 16:40, Israeli forces moved into ‘Anabtah village, east of Tulkarm. They raided and searched 2 houses belonging to Soheib Bilal Mohammed Noor (24) and Abdul Karim Sa’ed Barakat (25) and then arrested them. At approximately 19:30, Israeli forces moved into Beta village, south of Nablus. They confiscated a DVR from al-Tayeh Petrol Station in the village. The Israeli forces claimed that a number of young men threw a Molotov Cocktail at a female settler’s car traveling on Ramallah-Nablus Street near the village intersection. Meanwhile, a number of civilians gathered and threw stones and empty bottles at the Israeli soldiers. The Israeli forces brought a bulldozer and closed the village entrance with sand barriers and cement cubes and at approximately 21:30 withdrew from the village. At approximately 23:25, Israeli gunboats stationed off al-Sudaniyah shore in the northern Gaza Strip, heavily opened fire at Palestinian fishing boats sailing within 5 nautical miles and chased them. As a result, the fishermen were forced to flee fearing for their lives, but neither casualties nor material damage was reported. Note: During the aforementioned day, Israeli forces conducted (3) incursions in the following areas and no arrests were reported: Bani Na’im and Kafel Hares villages, and Halhoul, north of Hebron. At approximately 00:35, Israeli gunboats stationed off al-Sudaniyah shore in the northern Gaza Strip, heavily opened fire at Palestinian fishing boats sailing within 5 nautical miles and chased them. As a result, the fishermen were forced to flee fearing for their lives, but neither casualties nor material damage was reported. At approximately 01:00, Israeli forces moved into Taqou’a village, east of Bethlehem. They raided and searched a number of houses and then arrested Mousa Mahmoud al-‘Amour (17), Abdul Rahman ‘Adel al-‘Amour (24), Mahmoud Samir al-‘Amour (16) and Ibrahim Yusuf Abu Mefreh (22). At approximately 01:20, Israeli forces moved into Deir Estia village, northwest of Salfit. They raided and searched 2 houses belonging to Ahmed Sobhi Abdullah Sheikh Abdullah (19) and Ashoush Dawoud Mohammed ‘Obaid (26) and then arrested them. At approximately 01:30, Israeli forces moved into al-Qadi Valley area, east of Hebron. They raided and searched a house belonging to Majdi Mohammed al-Rajbi (23) and then arrested him. At approximately 02:00, Israeli forces moved into Beit Led village, east of Tulkarm. They raided and searched a house belonging to Khalid Jaber Mohammed Kou’a (22) and then arrested him. Around the same time, Israeli forces moved into Marah Rabah village, south of Bethlehem. They raided and searched a house belonging to Yasser Ahmed al-Sheikh (25) and then handed him a summons to refer to the Israeli Intelligence Service in “Gush Etzion” settlement complex, south of the city. At approximately 02:30, Israeli forces moved into Yatta, south of Hebron and stationed near al-Quds Open University. They raided and searched a house belonging to Hammad ‘Ali Zain (29). They withdrew from the house, and no arrests were reported. At approximately 03:40, Israeli forces moved into Shuwekah Suburb in Tulkarm. They raided and searched a house belonging to Haneen Abdul Qader Saleh ‘Amar and then handed him a summons to refer to the Israeli Intelligence Service. Note: During the aforementioned day, Israeli forces conducted (10) incursions in the following areas and no arrests were reported: Kafer Qadoum village, northeast of Qalqiliyah; Dura, Hebron, Qafin, Baqa al-Sharqiyah, Nazlet ‘Essa, Nazlet Abu al-Nar, al-Nazlah al-Wusta villages, north of Tulkarm; Deir Balut village, west of Salfit; and Kafel Hares village, north of the city. At approximately 01:30, Israeli forces moved into Beit Ummer village, north of Hebron and stationed in al-Qadi Valley. They raided and searched a house belonging to Yusuf ‘Ali al-‘Aalami. The soldier then fixed a leaflet on the house door threatening the stone-throwers of being punished and their families’ work permits will be cancelled if they continue to throw stones. At approximately 03:30, Israeli forces moved into Silwad village, northeast of Ramallah. They raided and searched several houses and then arrested Fadi Abdul Rahman Hammad (22). Around the same time, Israeli forces moved into Surif village, west of Hebron. They raided and searched a house belonging to Ibrahim ‘Ali al-Hour (29) and then arrested him. At approximately 05:15, Israeli forces accompanied with 10 military vehicles moved into Noor Shams refugee camp, east of Tulkarm. They raided and searched a number of houses and then arrested 4 former prisoners namely Fares Mohammed Abdullah Khalifah (spent 12 years in prison), Mahfouth Nathmi ‘Ali ‘Aishah (33) (spend 13 years in prison), Nehad Yusuf Abu Harb (28) (spent 5 years in prison), and Ahmed ‘Ali Abdullah Qasido (28) (spent 6 years in prison). At approximately 16:00, Israeli forces moved into Salem village, northeast of Nablus. A number of Palestinian youngsters gathered and threw stones and empty bottles at the Israeli forces. The soldiers fired live and rubber bullets and tear gas canisters. As a result, a 19-year-old civilian sustained a live bullet wound to the left thigh near the village council building. He was transferred to Rafidiya Hospital to receive medical treatment. At approximately 19:00, Israeli force accompanied with 10 military vehicles moved into Deir Estia village, northwest of Salfit. They patrolled the streets and then forced the shops’ owners on the main street to close. The Israeli forces claimed that a settler’s car was stoned and targeted with a Molotov Cocktail while it was on the main street (Qana Valley Street). The Israeli forces later withdrew from the village, and no raids or arrests were reported. Note: During the aforementioned day, Israeli forces conducted (5) incursions in the following areas and no arrests were reported: Qalqiliyah and Kafe al-Deek village, west of Salfit; Halhoul and Hebron and Sa’ir. At approximately 00:30, Israeli forces moved into al-Dawhah village, west of Bethlehem. They raided and searched a house belonging to Mohamemd Samih ‘Azziyah (25) and then arrested him. At approximately 01:00, Israeli forces moved into al-‘Ezzah refugee camp, south of Bethlehem. They raided and searched a house belonging to Shadi Mohammed Badawneh (30) and then arrested him. Around the same time, Israeli forces moved into Jenin. They raided and searched a number of houses and then arrested ‘Ala’a Mahmoud Abu al-Rab (26). Around the same time, Israeli forces moved into Jenin refugee camp, west of Jenin. They raided and searched a number of houses and then arrested Wesam Eyad Ahmed Mohammed Hanoun (22). At approximately 01:30, Israeli forces moved into Kufu Thuluth village, east of Qalqiliyah. They patrolled the village streets and deployed in the area. The soldiers raided and searched a house belonging to Diya’a Abdul Haleem Shawahneh (25) and then arrested him. At approximately 02:00, Israeli forces moved into Bethlehem and stationed on al-Saf Street in the center of the city. They raided and searched a number of houses and then arrested Mohammed ‘Adel al-Kamel and Dawoud al-Bam. Around the same time, Israeli forces moved into Beit Dajan village, east of Nablus. They raided and searched several houses and then arrested Marwan Bassam ‘Omari (22). Around the same time, Israeli forces moved into al-Samou’a village, south of Hebron. They raided and searched a house belonging to Rasmi Saleh al-Mahariq (55) and then confiscated his car. At approximately 03:00, Israeli forces moved into al-Maghir village, northeast of Ramallah. They raided and searched a number of houses and then arrested Qusai Mustafa Abu ‘Alia (18). Around the same time, Israeli forces moved into Qarawet Bani Zaid village, northwest of Ramallah. They raided and searched a house belonging to Saif Mahmoud ‘Arar (25) and then arrested him. At approximately 03:30, Israeli forces moved into Beit Fajjar village, west of Bethlehem. They raided and searched a house belonging to Mohammed Ahmed Taqatqa and then arrested him. Note: During the aforementioned day, Israeli forces conducted (5) incursions in the following areas and no arrests were reported: Beit ‘Awa, Yatta, Dura, Halhoul and Surif village in Hebron. On Tuesday, 13 February 2018, Israeli forces allowed 2 persons, who work at the General Authority of Civil Affairs (GACA) and internationals to renew their permits. On Wednesday, 14 February 2018, Israeli forces allowed 12 persons; on Monday, 12 February 2018, 2 persons; and on Tuesday, 30 January 2018, one person to return to the West Bank. At approximately 19:15 on Monday, 12 February 2018, Israeli forces established 2 checkpoints at the main entrance to al-Nabi Saleh village, northwest of Ramallah; and at ‘Atara village’s bridge, north of the city. At approximately 21:15, Israeli forces iron gates established at the entrance to Dir Abu Mish’al village, northwest of the city. At approximately 09:30 on Tuesday, 13 February 2018, Israeli forces established a checkpoint at the entrance to ‘Ain Yabroud village. At approximately 20:40, a similar checkpoint was established at the entrance to Kafur Malek village, northeast of Ramallah. Hebron: Israeli forces established (22) checkpoints all over the city. On Thursday 08 February 2018, Israeli forces established 4 checkpoints at the entrance to al-Fawar refugee camp, at the northern entrance to Halhoul village, and at the entrances to al-Majd and Dir Razieh villages. On Friday, 09 February 2018, 3 similar checkpoints were established at the entrances to Samou’a, Beit Ummer, and Raboud villages. On Saturday, 10 February 2018, Israeli forces esatablished 3 checkpoints at the entrances to Ethna and Tawas villages and at the entrance to al-Fawar refugee camp. On Sunday, 11 February 2018, 2 similar checkpoints were established at the entrances to Yatta and Beit Ummer villages. On Monday, 12 February 2018, Israeli forces established 4 checkpoints at the northern entrance to Hebron, at the northern entrance to Halhoul village, and at the entrances to Sa’ir and Tarama villages. On Tuesday, 13 February 2018, Israeli forces established 3 checkpoints at the entrance to al-‘Aroub refugee camp, at the entrance to al-Hadab village, and on al-Dairat Road. On Wednesday, 14 February 2018, Israeli forces established 3 checkpoints at the western entrance to Hebron and at the entrances to Beit Kahel and al-Nabi Yunis villages, north of Halhoul. Qalqiliyia: Israeli forces established (4) checkpoints all over the city. On Thursday, 08 February 2018, Israeli forces established 3 checkpoints at the eastern entrance to Qalqiliyia and at the entrances to ‘Izbit al-Tabeeb and Hijah villages, east of the city. At approximately 15:00 on Sunday, 11 February 2018, Israeli forces established a checkpoint at the eastern entrance to Qalqilyia. On Thursday, 08 February 2018, Israeli forces established 2 checkpoints at the entrances to Kaful Hares village, north of Salfit; and at the entrance to Dirsityia village, northwest of the city. At approximately 14:55 on Sunday, 11 February 2018, Israeli forces established a checkpoint at the entrance to Dir Balout village, west of Salfit. At approximately 22:25, a similar checkpoint was established at the entrance to Qarawet Bani Hassan village, northwest of the city. At approximately 16:00 on Thursday, 08 February 2018, Israeli forces stationed at the entrance to al-Fawar Refugee Camp, south of Hebron, arrested Safwan Ahmed Abu ‘Awaad (17), claiming that he had a knife. Following the Friday prayer, on 09 February 2018, Israeli forces established a checkpoint for searching worshipers while getting out of the Friday prayer from al-Ibrahimi Mosque in Hebron’s Old City. During which, the Israeli forces searched Palestinian civilians passing through the western gate. Meanwhile, Saif Subaieh al-‘Ajlouni (20) was arrested and then taken to a Police Station in “Kiryat Arba” settlement, east of the city. On Wednesday, 14 February 2018, Israeli forces arrested 3 Palestinians at a military checkpoint established near Salem Camp, west of Jenin. Media stated that the Israeli forces arrested Hamza Mohamed ‘Omar Kmail and ‘Iz al-Deen Mahmoud Saba’nah while the 3rd person is so far unidentified.